The flooding in the inhabited areas around here has subsided, but there are still parts that are underwater. I eased my car up to the park entrance and tried to comprehend its status. The portable street department barricade seemed to indicate it was closed. But then again, it was half toppled, two of it’s metal legs sprawled on the asphalt, and some of the wood was splintered. So I took the chance and followed the road up and over the earthen flood-control berm and descended into the riverside park. At the shelter, I spotted three parked vehicles and few people milling around. It was the weekend, so I was pretty sure they weren’t city workers. If I was entering a restricted area, at least I wasn’t going to be the only one getting in trouble. 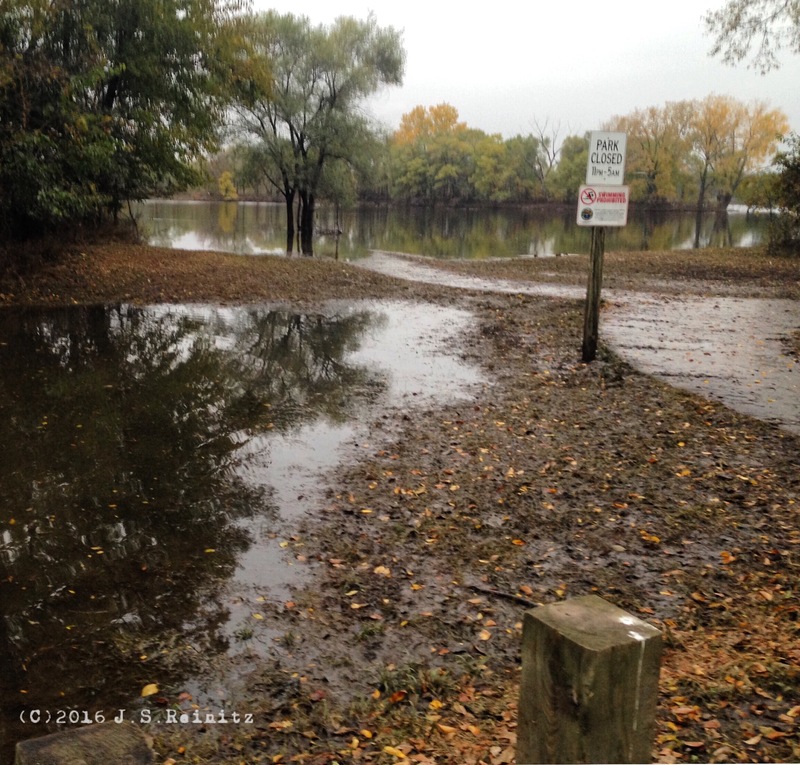 Beyond the shelter, the backwater lake was overflowing, and water covered sections of the walking path. On down the road I drove until the water began to lap at the pavement, and I pulled over to explore on foot. I didn’t get too far before my shoes found mud. Not your typical soaked earth, this was flood river mud. It had a fine, smooth consistency, smelled like rotting fish and clung to everything it touched. Perhaps the barricades weren’t to keep us from danger but were to save us from the muck and the stench. LOS ANGELES – A man who was recently extradited from Mexico to face federal charges related to the illegal trafficking of the world’s largest freshwater fish pleaded guilty this afternoon to smuggling two Arapaima gigas to Canada.Isaac Zimerman, 66, who formerly resided in West Hills, pleaded guilty today to the smuggling charge before United States District Judge Otis D. Wright II. In a plea agreement filed yesterday in United States District Court, Zimerman admitted that he smuggled two Arapaima gigas to Canada. At the time, Zimerman knew that he was illegally exporting the fish because they are protected under the Convention on International Trade in Endangered Species of Wild Fauna and Flora (CITES) and they could not be exported to another country without a CITES re-export permit, which he did not have. Zimerman was initially charged in 2009, along with his company, River Wonders LLC, and his wife, Leonor Catalina Zimerman. River Wonders also pleaded guilty this afternoon to attempted smuggling of 10 Arapaima gigas to a resort in the Bahamas. Piranhas. Stock photo courtesy of U.S. Fish and Wildlife Service. You’d think smuggling piranhas into the country would be difficult. I picture delicately carrying a stainless steel water bottle through airport screening, trying to be nonchalant and taking fake sips while keeping your lips far enough back so the fish don’t bite. Or maybe loading the fish into hollowed-out acrylic platform shoes. At any rate, the task would seem to risk losing hands or at least fingers. But no. Apparently it’s easier than that. A New York business allegedly smuggled 39,548 piranhas into Queens. All it had to do was put them into shipping containers mislabel “silver tetras” (note to potential importers: Don’t put piranhas into shipping containers mislabel “silver tetras” as it could result in an unbalanced ecosystem, probation and fines). Joel Rakower, along with his solely-owned corporation, Transship Discounts Ltd., pleaded guilty today in federal court in Brooklyn, N.Y., to violating the Lacey Act by mislabeling imported piranhas. In the plea agreement, Rakower admitted that his company purchased piranhas from a Hong Kong tropical fish supplier and imported them to Queens, N.Y. Each such import must be accompanied by a packing list describing what wildlife is contained in the package being imported, and the importer must provide this packing list to the United States Fish and Wildlife Service upon import for inspection. 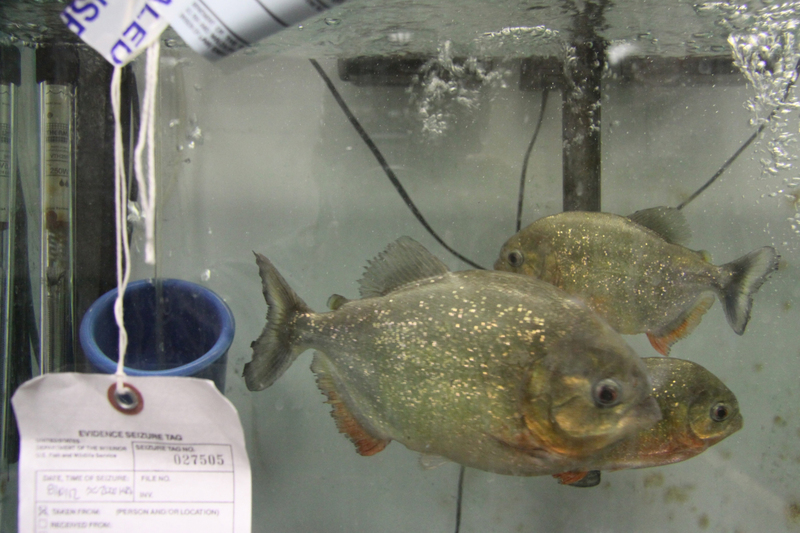 In March of 2011, shortly after New York City prohibited possession of piranhas, Rakower instructed the foreign supplier to falsely label the piranhas on packing lists as silver tetras, a common and unaggressive aquarium fish. Over the course of 2011 and 2012, Transship submitted packing lists to the Fish and Wildlife Service containing false identifications of 39,548 piranhas, worth approximately $37,376, which Transship then sold to fish retailers in several states. Under the plea agreements, Rakower agreed to pay a $3,000 fine. Transship agreed to serve a two-year period of probation, pay a $35,000 fine and pay $35,000 in restitution to the State of New York’s Department of Environmental Conservation Division of Law Enforcement. Piranhas are freshwater fish originating from South American rivers such as the Amazon, Orinoco, Guyana and the Sao Francisco river systems. They are extremely aggressive and territorial, feeding on insects, fish, and larger prey such as amphibians, reptiles and mammals. As a result of piranhas’ aggressiveness, 25 states have either banned or regulated piranhas, making them illegal to own or sell. Piranhas, an injurious species, could pose a serious risk if they escaped into native water systems, potentially damaging ecosystems through aggressive predation or injuring people or pets. Tropical fish enthusiasts can contribute to this possibility by releasing piranhas into the wild when they grow too large for a tank. Although piranhas originate from tropical waters, they are able to withstand much cooler water temperatures, creating fear that they may even become established in more northern US waters. Effective regulation of piranha possession and sales within the United States depends on accurate reporting of piranha imports; concealing the fish upon import facilitates their entry into the black market in states that have banned or strictly regulated piranhas to protect state waters and ecosystems. 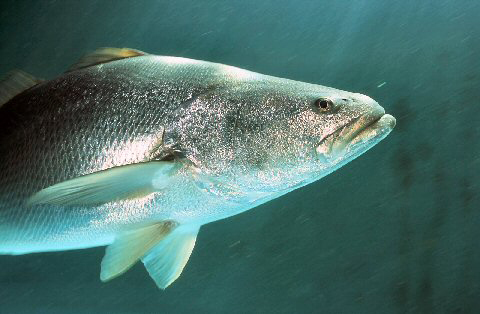 SAN DIEGO — Federal authorities Wednesday announced the filing of criminal charges against seven individuals for their role in plundering and smuggling swim bladders belonging to the endangered Totoaba fish that lives exclusively in Mexico’s Sea of Cortez. Collectively the seven individuals, who were charged over the last three months in separate criminal complaints and indictments, are believed to be responsible for the illegal importation of more than 500 Totoaba bladders seized at the Calexico Port of Entry. The bladders, an ingredient in a centuries-old Chinese soup, are dried and then sold on the black market in Hong Kong and mainland China where they fetch as much as $10,000 each. Agents with U.S. Immigration and Customs Enforcement (ICE) Homeland Security Investigations (HSI) and the U.S. Fish and Wildlife Service (FWS) began investigating the unusual smuggling activity in February after an officer with U.S. Customs and Border Protection (CBP) uncovered the first load of bladders in an ice chest buried under layers of non-regulated fresh fish. Two of the seven defendants are charged in a three-count indictment handed down by a federal grand jury in San Diego April 10. Jason Xie, a 49-year-old Sacramento businessman, and Anthony Sanchez Bueno, a 33-year-old Mexicali resident, were taken into custody March 30 by HSI and FWS agents in Calexico. 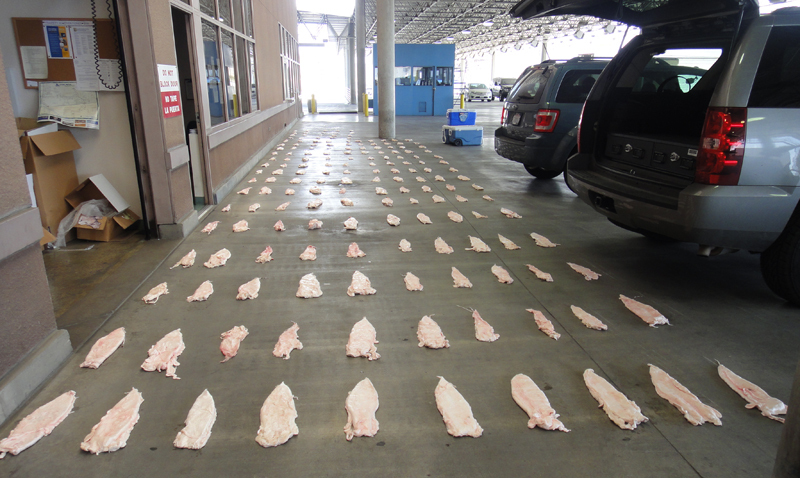 Sanchez was arrested after driving a vehicle containing approximately 170 Totoaba fish bladders through the Calexico Port of Entry and delivering them to Xie. The two had arranged to meet in the parking lot of a fast food restaurant. Sanchez told investigators he was to be paid $700. The indictment also seeks the forfeiture of $350,000 in illicit proceeds from the sale of the Totoaba bladders. “Many species, including the Totoaba, are teetering on the brink of extinction due to poaching to supply the illegal wildlife trade. While we may never know how many Totoaba bladders were harvested illegally, such disregard for the protections that were put in place to benefit this endangered species could have a disastrous effect on the fish population,” said FWS Deputy Chief Edward Grace. Tototaba fish have been listed as an endangered species under the U.S. Endangered Species Act since 1979. Because the species is federally-protected in both the U.S. and Mexico, it is illegal to take, possess, transport or sell Totoaba. The fish, which can measure up to seven feet long and weigh more than 200 pounds, are known to live for up to 25 years. Federal charges have been filed in San Diego against seven peolpe investigated by the Service for smuggling swim bladders of endangered totoaba fish into the United States from Mexico. More than 500 of the bladders, which are valued in certain cultures as a soup ingredient and culinary delicacy with alleged medicinal properties, have been seized to date. The bladders sell for as much as $10,000 each in Asian markets. The murky depths of a swamp can hold a lot of secrets — ditched stolen cars, lost treasure, enemies. The thick muck, opaque water, diseased insects and noxious odor of decay and rot swirl together in a concoction that keeps all but the most brave or most mad at bay. So it was with high expectations that we set out to explore a local swamp a few months ago. Not that were were particularly brave — or even mad for that matter. 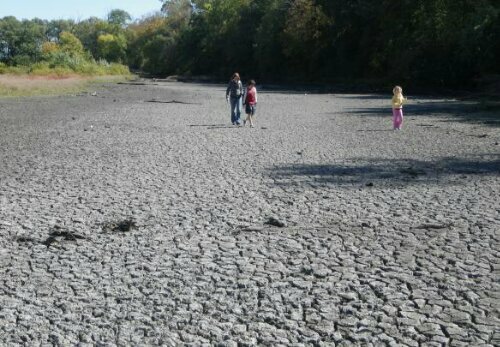 The long-dry summer had taken its toll on the marsh, dried it to the bone and sucked out most of the hazards. 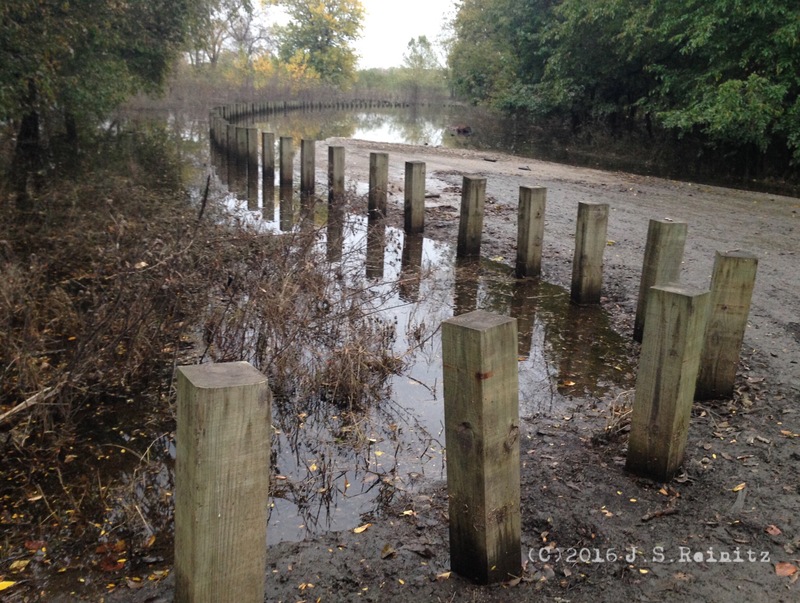 It wasn’t a big swamp to begin with, just a section of soggy ground, a pond and a half-submerged forest wedged between a bluff, a bike trail and a highway. Not a destination, barely a waypoint. With the drought, the north rim was now a thick a field of purple flowers, and most of what had been under water now resembled a desert. Dusty cracks waffled the ground, which had a spongy spring when stepped upon. There was still moisture buried underneath. You could find it if you dug deep enough. We found a pair of hubcaps early on, and as we moved on, we located a plastic baseball, then a golf ball, then another golf ball. A small mound of debris farther on caught our eye, and we approached, finding three or four cut milk jugs tethered metal 5-pound plate, the kind one loads onto a barbell. My best guess was it had been a fish trap, fish bait or fish habitat — something fishy. A shallow spot on the dried mud flat still held water, maybe a few inches deep and five feet across. As we neared, the water came alive, rippling as if blown by a gust of wind. It was actually frogs and guppies, which once fanned out over the marsh and now packed densely into what little water remained. Noticing our presence, they began hopping to the far end of the puddle. Moving past the frog pond and heading deeper into the swamp, we came to what were once islands, now completely approachable by foot. 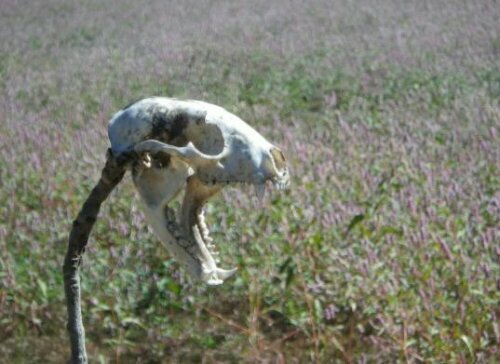 They were little tufts of earth topped with grass and bushes and popping out of the deserted plain. As we looped back on our way out, we cut through the field of flowers that spread across what had been the shoreline. Not far inside, we discovered an animal skull, perhaps once belonging to an opossum. The bone was bleached white, and the jaw was intact. The kids studied it, figuring out where the eyes and other features had been. At the end of the hike, we climbed out of the swamp’s dusty remains, not finding any great secrets but getting a rare glimpse of what’s at the bottom.